I just made another thank you card, need so many these days, only had one left in my stack! I used merci and almond blossoms stamps from Impression Obsession. 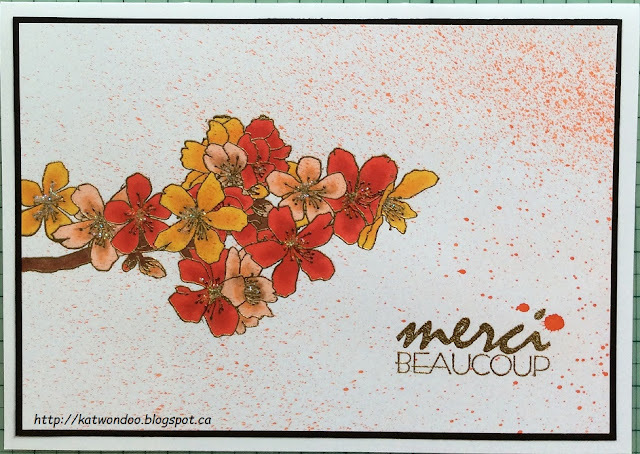 Background was made with Lindy's Stamp Gang spray and flowers were embossed in gold and colored with Spectrum Noir markers (GB3+GB5, CR9+CR11, CR2+CR1). Added some Star Dust stickles and voilà! A gorgeous vard Katwonde, a lovely design with such beautifully colour cute image along with gorgeous details!! Jolie carte! Bonne idée les fleurs embossées! J'aime beaucoup aussi l'étampe "sentiment" choisie. L'ensemble est parfait!